Did you miss Day 1? Read it here! 2am…again? Who’s idea was this anyway? Mine? Dang. The good news is the marathon field was less than half the size of the prior day. It was neat to run a marathon where everyone was attempting that distance. A first for me! This was also the first race where I started sweating before the race started.With temps in the 60’s and humidity near 100%, that was inevitable. 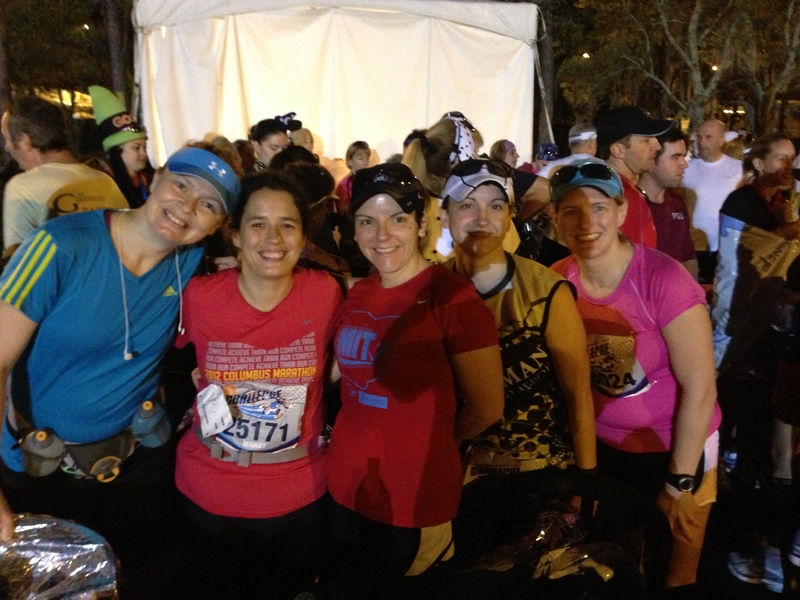 Hydration was going to be key today…the hottest WDW Marathon in the 20 years since it’s inception. Again we started the day with Jeff Galloway. The walk to the corral was considerable faster and this time we were in the corral for the National Anthem and the 5:30 fireworks. Our corral started at 6:03am, right on schedule…thanks Mickey! 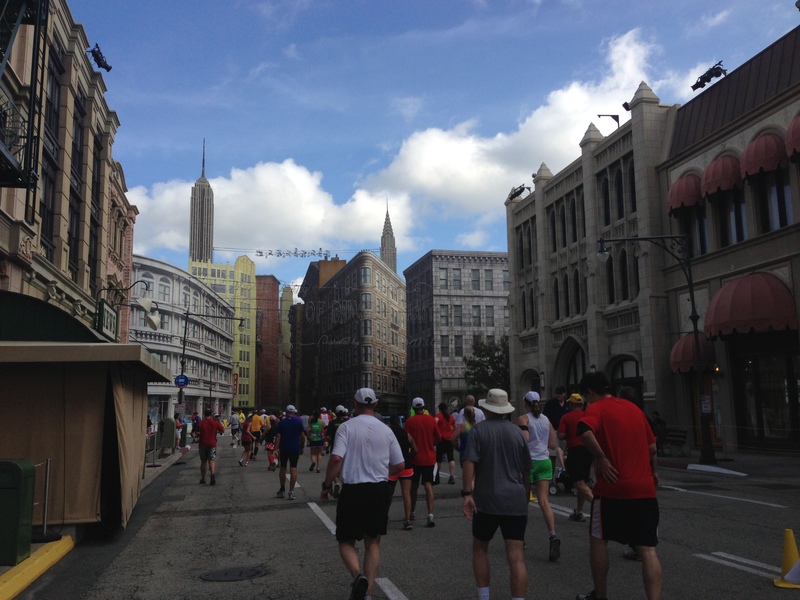 The marathon course took us from Epcot to the Magic Kingdom and Cinderella’s castle, just as we did the previous day. 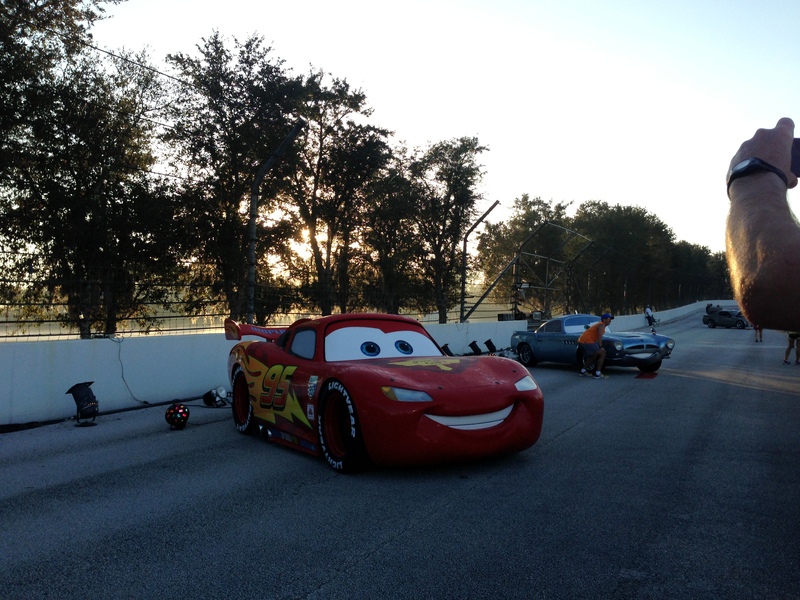 Rather than heading back to Epcot, we took to the track at the Disney Speedway. 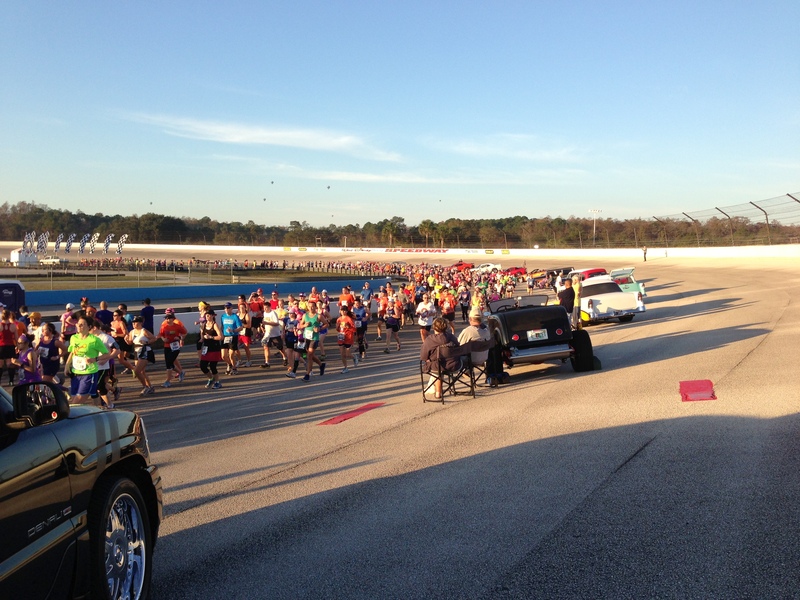 I loved seeing the track full of runners, a variety of classic and race cars, and hot air balloons in the distance. Laurie and I were still sticking to the plan…a little slower than the previous day…and we had picked up a friend, Christine, who stayed with us through mile 10. I was following my run/walk schedule of 2:1, just as I had done the day before, with a little extra walking through the aid stations to ensure we were hydrating enough. By this time we were ready to stop for the bathrooms, and I knew our hydration was spot on. Just after the first Chiquita banana stop…amazing!…we found a short line and stopped. Next up: Animal Kingdom. A few birds, a snake, and some petting zoo type animals were out neat the entrance. We passed Expedition Everest and Dinoland USA. Sadly luckily there were no dinosaurs roaming about. 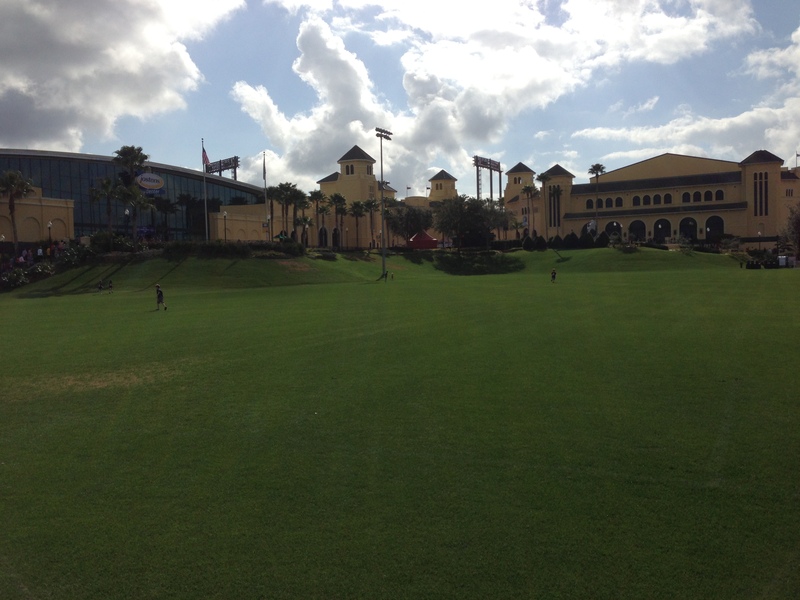 On to ESPN Wide World of Sports! Familiar territory as we were here for the expo. The course looped the grounds, around the rubberized track (a nice change), and a quick trip on the gravel surrounding the baseball stadium (a not-so-nice change). After a quick stop to get the rocks out of our shoes, we finally saw our friends and the bags of washcloths and oranges! I loved having our friends on the course…what a blessing! And here’s everybody hanging out at Mile 20! Last park…Hollywood Studios. The most memorable part was the tunnel…shade! It was ridiculously hot by this point, and I was thankful for a break from the sun. 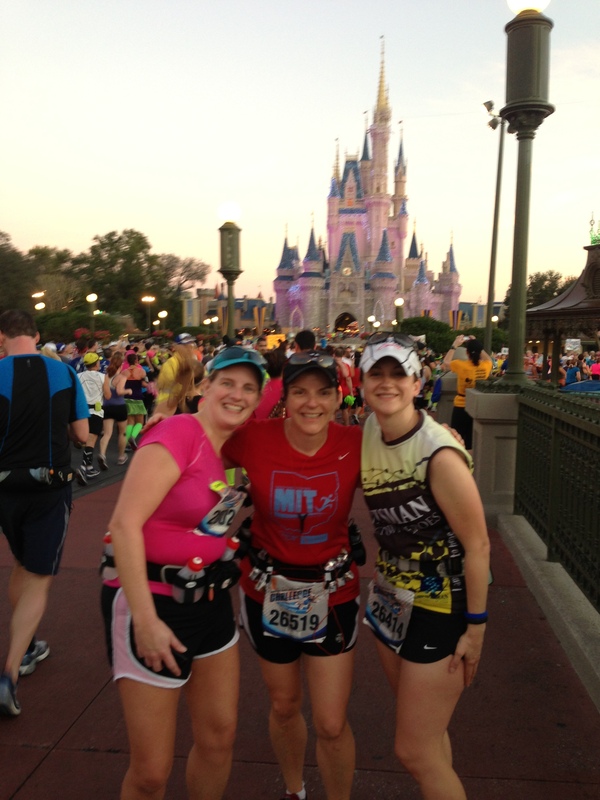 Laurie asked if we could take a break here…but with just over a 5k to go, I declined. A trip through the Streets of America, complete with trompe-l’œil buildings, and a loop around the Boardwalk, and we were back running through through the countries of Epcot. I had the most energy ever at the end of this race. So much so, that Laurie told me to go, and then fell back so I would. She was probably sick of me after 36 miles anyway. So I ran…and I felt like I was flying. It didn’t hurt that many people were walking by this point. I crossed the line around 5:33, and to my surprise, there was Bart Yasso, looking like he was waiting for someone (presumably me!). Everyone was so busy high-fiving Mickey at the finish and heading for water, and he looked lonely. So I called out his name, and gave him a big, sweaty hug. And best of all? He didn’t mind. He even commented later that he LIKES sweaty hugs. That’s my kind of man! After some refueling, we walked back to the car, and heard that sweet sound…clang, clang, clang…all the way home. The Goofy was mine. 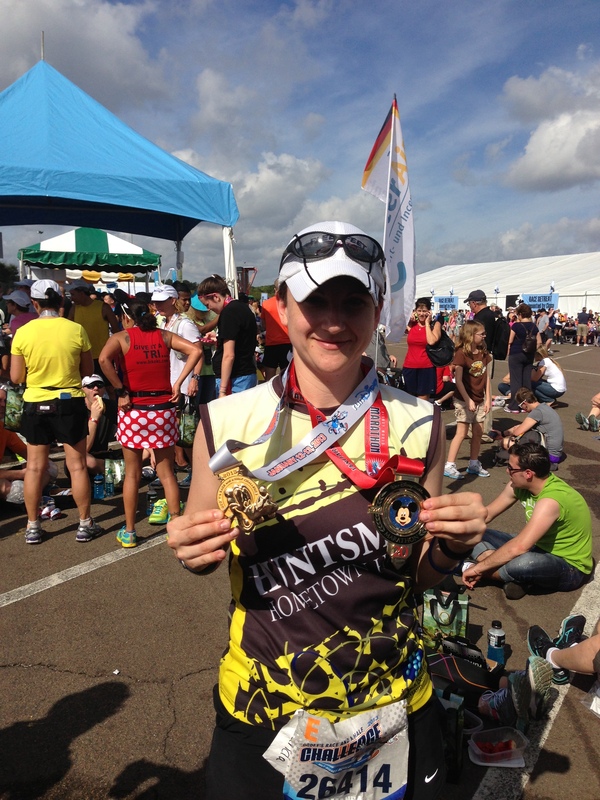 A tribute: As you can see from the pictures, I wore my Huntsman Hometown Heroes jersey during the marathon. I get so much inspiration from running in memory/in honor of those who both lost and won their battle with cancer. A few of those miles were dedicated to some special people, and I’d like to mention them here. They are the real heroes. 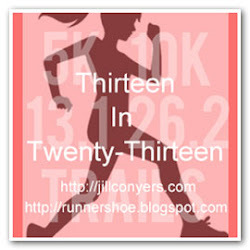 Mile 10-14 – Christopher R.
This entry was posted in Race Recap and tagged Bart Yasso, Disney, Goofy, Goofy Challenge, Jeff Galloway, Marathon, Mickey, WDW. Bookmark the permalink. Amazing!!! And so exciting! Congrats again, Amanda! So proud of all you ladies. Reading all the race recaps just re-affirms that even though I’ve “retired” from road marathons, this one STAYS on my bucket list. Someday I will run the Goofy! After all, it’s the most Magical Place on earth! We’re not going back until 2015. Sounds meant to be. And gives me plenty of time to save 🙂 Maybe….